During February I was sort of blocked on some rifle reloading I wanted to do. I needed to test out some new loads before I went “into production” with them. I normally like to do my rifle load tests in Idaho where I have several hundred yards available. I went to Idaho a couple weeks ago but there was so much snow that I ended up not having the energy and time to snowshoe the distances required to set up the targets and do the shooting I wanted to do. I finally joined a local range in the Seattle area which has 200 yards available. I went there yesterday and did some of the testing I wanted to do. I reloaded 80 sample rounds with various charges and bullets for .300 Win Mag and another 99 rounds finishing off some old bullets. In .223 I reloaded 60 sample rounds in various charges for one powder and bullet. I was able to test these and concluded I should test a different powder before settling for the best this combination could give me. This last month I spent a lot of time prepping .300 Win Mag brass. 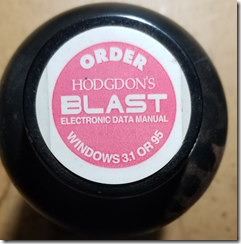 I purchased the Belted Magnum Collet Resizing Die suggested by Bob B. That was an interesting experience. The die arrived a day later than I had expected it, which meant I was out of state for over a week when it arrived and I was unable to do any testing until I got back. And worst of all the website doesn’t say anything about it only working in single stage presses. The die inserts from the bottom of the toolhead and the bottom of the die hits the index sprocket before it fully engages the cartridge case. The index sprocket was always a mystery to me. It seemed to be fastened in some way to the shellplate bolt. It would rotate independently from the bolt but would not come off. I figured that during assembly they had shrunk or resized the sprocket such that it would not come off. I started filing away on the index sprocket on my Dillon 550 so it would allow the ram to raise high enough to fully engage the collet resizing die. When I realized that it probably was going to result in that tooth of the sprocket either being completely removed or so frail it would break I went online to order a new bolt and sprocket to use for reloading. I would use the modified one for resizing with the new die. Much to my surprise the bolt and sprocket were sold as independent parts. I ordered a new sprocket to replace the one I had filed on. I went back to my existing sprocket and bolt and decided they were supposed to be separable. A vice and a few blows from a plastic hammer and they came apart. Well, that would make it easier to file or use the Dremel tool on the old sprocket. I was explaining what I was working on to Barb and all of a sudden I realized I no longer needed to modify the sprocket! I could just put the bolt into the shellplate without the sprocket and the new die should work fine. I soon started resizing my oversized cases. It’s a little slow but it works fairly well. There are still a few pieces of brass that won’t go into the cartridge gauge but I have successfully resized hundreds of cases now. I’m almost done with the resizing. I then have to trim, clean the primer pockets, and clean a few hundred cases before I can crank out loaded ammunition. I have lots of one fired brass but I knew that brass wouldn’t chamber in any some other rifles even though I was using a full length resizing die. I got my hands on a .300 Win Mag rifle that had problems chambering it. Then with a few rounds of empty, once-fired, brass, my micrometer, and the specs for the brass I sorted out the problem. I found the case just forward of the belt was one to two thousands of an inch larger in diameter than spec. 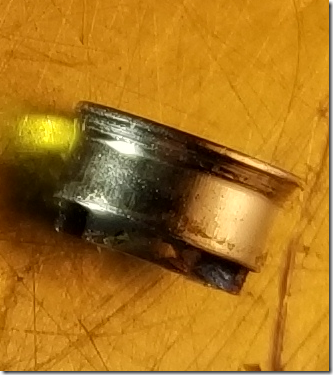 I think the die is the problem so I ordered a new resizing die from a different manufacture and which I expect will fix the problem. The new die arrived yesterday. It does fix the problem, but just barely. The specification for the case dimension in question is 0.513 inches. The once fired cases were 0.514” –> 0.515”. After going through the new die they are about 0.5135. The brass chambers, but it is tight. I ordering still another die. Update: I looked up the SAAMI specs on the cartridge and chamber rather than what the reloading manuals tell me. The portion in question of the case is specified as 0.5126”. The chamber is specified as 0.5136”. I suspect the rifle in question is at exactly the minimum specification while the dies, combined with the “spring-back” of the brass being used results in something oversized. I ordered an RCBS undersized die which should solve the problem. Update 2: Thanks to an email from Bob B. I ordered what looks like a better solution. The Belted Magnum Collet Resizing Die. I canceled the order for the RCBS undersized die. This month I finished off all 2,982 .40 caliber bullets I had on hand. That was 2,510 Montana Gold JHPs and 472 Acme Bullet Company’s polymer coated lead bullets (sometimes called “lipstick” bullets because of their bright red color). I loaded 212 rounds of .300 Win Mag. I was close to finishing off one of my powders for this caliber when I ran out of new brass. I have lots of one fired brass but I knew that brass wouldn’t chamber in any some other rifles even though I was using a full length resizing die. I got my hands on a .300 Win Mag rifle that had problems chambering it. Then with a few rounds of empty, once-fired, brass, my micrometer, and the specs for the brass I sorted out the problem. I found the case just forward of the belt was one to two thousands of an inch larger in diameter than spec. I think the die is the problem so I ordered a new resizing die from a different manufacture and which I expect will fix the problem. After it arrives I will reload a bunch more .300 Win Mag to get rid of powder that is nearly 20 years old. 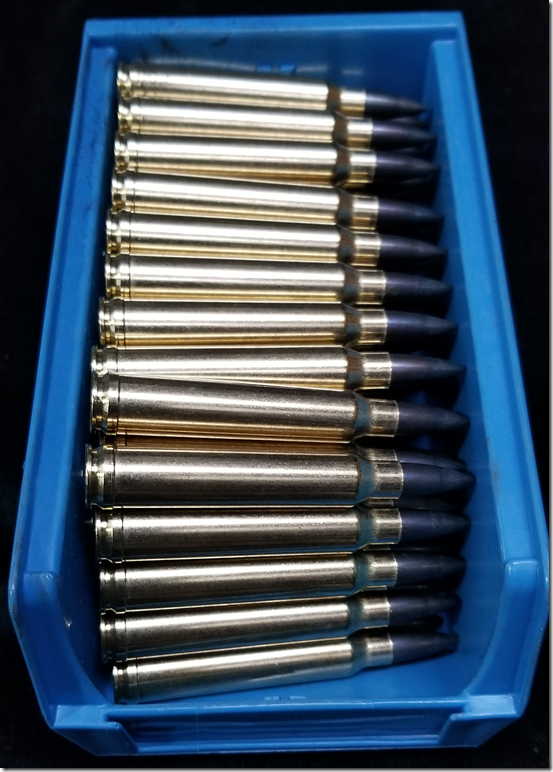 I loaded 87 rounds of General Dynamics SS109 bullets to finish off one of my .223 powders. Combined that is 3281 rounds reloaded in the last month. 2018 was another good year in terms of reloading. I reloaded 22,544 rounds. That is short of the 23,356 of last year but not by much. As usual most of that, 18,105 rounds, was in .40 S&W. That bring the total .40 S&W rounds reloaded to just under 100,000 and the total rounds reloaded up to 131,524. There is something about ability of the cartridge to be able to reach out and whack a target at 1000 yards away on your first shot that I find very satisfying. The first time I shot at 1000 yards I put the first three shots into the 10” diameter X-ring. That is a good as accuracy as you can expect to see at a public range when some random person is shooting a handgun at 10 yards. And at 1000 yards it is delivering twice the momentum to the target as a 9mm handgun would at 10 yards. I assembled 212 rounds of .300 Win Mag this weekend. Each charge was individually weighed. Ignoring the time to prep the brass, the average time for assembly of a single round was about 75 seconds. When reloading for .40 S&W it is about 4.5 seconds. In 1999 I started loading for 300 Win Mag. In fact, I had the gun built with the specific intention of shooting a particular bullet which I planned to handload. The bullet was the Berger 210 grain VLD Target. At that time the BC was listed as 0.640. Then in 2007 I was looking at their website and discovered they had changed the BC to 0.631. It still didn’t fully explain the results I was getting but it was closer. Today I discovered they have changed the BC again. It is now listed as 0.621. That fully explains the results I was seeing. Whoops on their part. I haven’t reloaded any of these bullets since 2000. It was time consuming. I would clean the primer pockets, trim the length, and individually weight each powder charge. I found that I got better accuracy at short ranges (less than 300 yards) and decent results at longer ranges with Black Hills Match (190 grain Sierra Match Kings with a BC of 0.533). And, most importantly, it saved me a lot of time. I still have the powder and primers for the Berger bullets and figured it was time to load it up. I now have a much better tool for prepping the brass which speeds up the prep by about a factor of four. This is with a 24″ barrel. 200 gr. bullet, max 80.0 gr -> 2984 fps. 220->225 gr. bullet, max 77.0 gr -> 2881 fps. This is with a 26″ barrel. and friction (especially without the moly) than the Berger will have. I settled on a load of 78.7 grains of H1000 after firing charges up to 79.5 grains. I measured the base of the case for expansion as my indicator of high pressure and didn’t find expansion greater than with the light loads. It seemed good but the gunsmith who built the rifle told me an interior ballistics program he used said my load was unwise. I continued to use that charge with the few rounds (423) that I actually loaded. Last night I checked the Hodgdon rifle reloading website and found they list a 208 grain bullet with a maximum load of 78.0 grains of H1000. And for one 200 grain bullet the maximum load is 77.0 grains! The max load for 220 grain Sierra Match Kings is 78.0 grains. That explains my mushroomed primers and validates my gunsmith’s concern. I need to redevelop my load and disassemble the existing ammo with the previous loadings. There are lots of grounds to challenge Washington state I-1639. None are a sure thing and since there are so many components to it seems likely the courts will throw out some aspects of it and leave others intact. 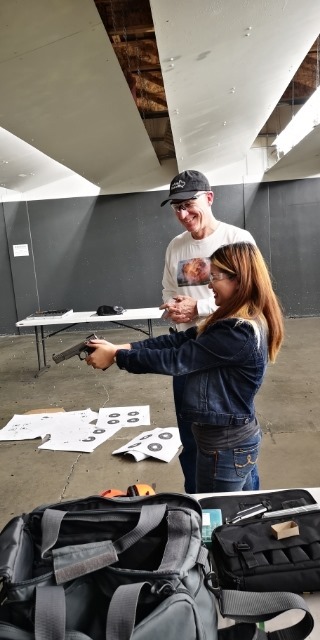 I have been wondering if the training requirement might be something we have power over and can eliminate even if the courts don’t find it a sufficient burden on the specific enumerated right to keep and bear arms. What if there were no classes that met the requirements of I-1639? Or, at least, the classes were so few, far between, and/or expensive that the vast majority of the population could not take the class. What if all trainers refused to include material which met the requirements? Wouldn’t the courts be, essentially, forced to say I-1639 is blocking the exercise of specific enumerated right? I realize gun manufactures are not meeting the microstamping requirement of California law. And that has resulted in no new guns being added to the list of “safe guns. But that is going through the courts now and may result in a path to a victory on one element of I-1639. I reloaded 4,069 rounds of .40 S&W last month. 406 rounds were 180 grain Hornady Action Pistol (HAP) bullets. 505 rounds were from Eggleston Munitions. These were 180 grain polymer coated bullets loaded really light for steel matches. 504 were blue and one was purple (it somehow found it’s way into the container of blue bullets). 1,567 rounds were loaded with red bullets from Acme Bullets. These were also loaded for steel matches. 1,591 of those rounds were 180 grain Montana Gold JHP to be used for practice at indoor ranges. This is the most rounds I have reloaded since the first month I started reloading back in October 1996 when I reloaded 10,944 rounds. The Dillon XL650 made the difference. Ignoring the time running the cases through the case gauge after assembling it more doubles my rate of production I was getting with the Dillon 550B. If I don’t have many malfunctions with a messed up piece of used brass or something I can reload 800 rounds in an hour. This month will not be so productive. I reloaded a few .40 S&W rounds but am switching back to the 550B to reload .223. Back in 2016 I purchased a bunch of components in preparation for a Hillary Clinton presidency and with the passage of I-1639 I now feel a need to do something to support the AR. I mentioned the other day that I tried out some 180 grain Hornady Action Pistol (HAP) bullets. 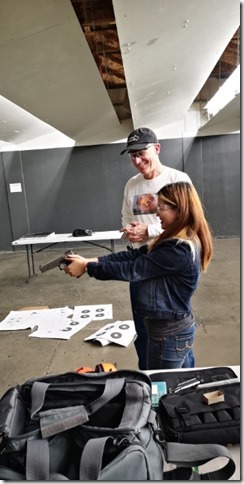 In one test of a 20 shot group they gave me better accuracy that any pistol bullet I can recall. I usually shoot a six shot group and “on a good day” get about a 1.5 inch group with the same load with 180 grain Montana JHPs. 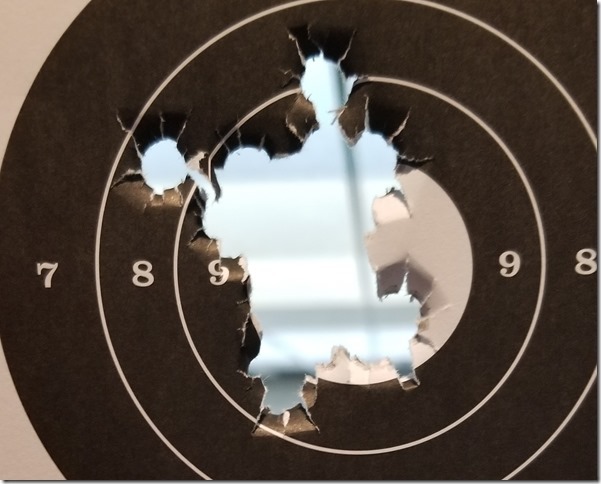 Using the group calculation feature of Modern Ballistics I converting the 20 shot group into the equivalent six shot group and got 1.26 inches. Hence HAP does appear to be have significantly better accuracy. I’ll shoot some more groups just for fun sometime, but the accuracy criterion for switching bullets, all other things being equal is “nearly as good” as the Montana Gold JHP. It more than meets this criterion. I also measured the weight variation of the bullets. 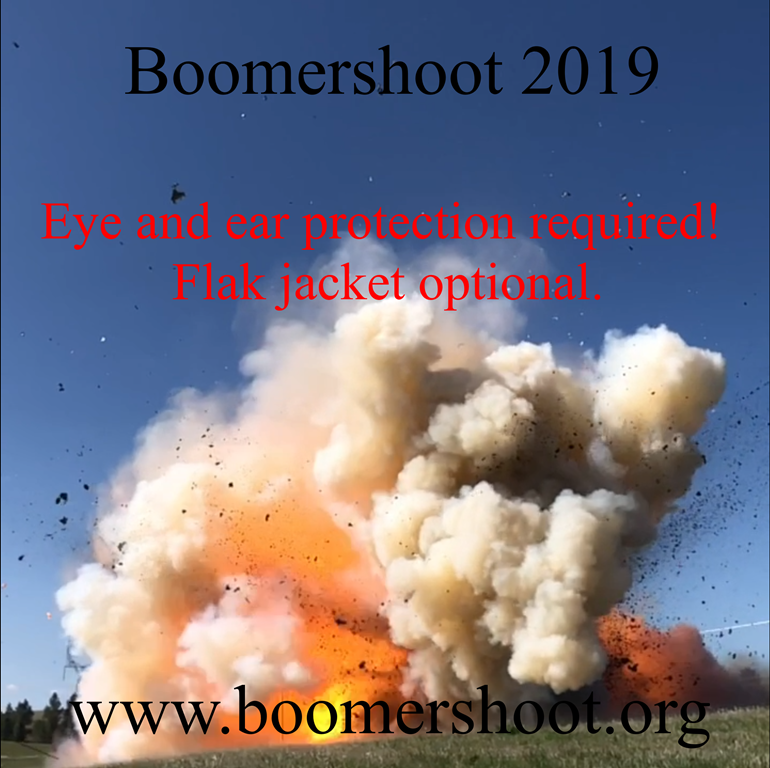 This is rather important because it can affect whether your ammo will “make major” power factor at USPSA matches. If the chrono man pulls a light bullet or two to compute your power factor you could end up shooting minor power factor. The extreme spread on the weight distribution would make a different of about +/- 0.44. This isn’t a big deal. 180 grain Montana Gold JHP have a tighter weight distribution but this is much better than what I measured with 180 grain .401 bullets from Black Bullet International. The weight distribution is acceptable to me. 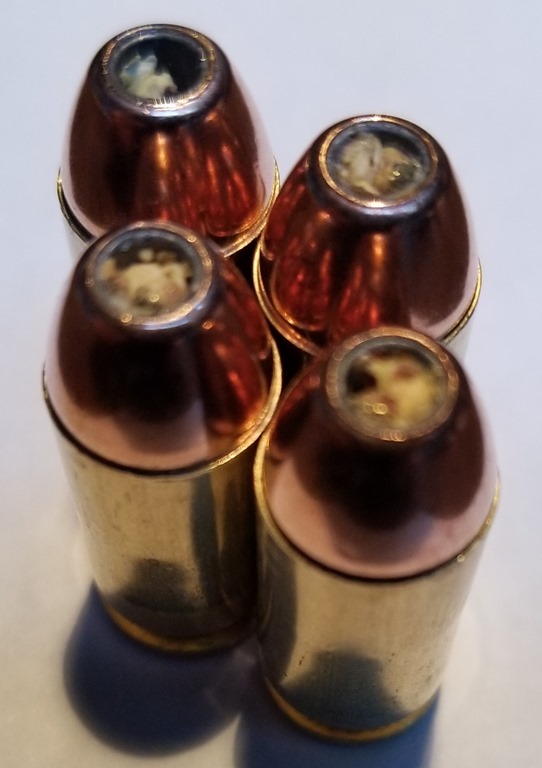 Five (only four shown here) of the bullets had the hollow point clogged with what looked like cleaning media, perhaps ground corn cobs. It was easy to remove the foreign material from the bullets but I have never seen this in the 120K+ rounds I have reloaded. It’s not a big deal but I was surprised they would have a process which would allow this to be possible. Overall their bullets meet my criteria even though they are a little more expensive than the Montana Gold I am currently using. I am switching bullets because they told New York they would not knowingly sell products to them. Widener’s has a raffle for “free ammo for a year”. 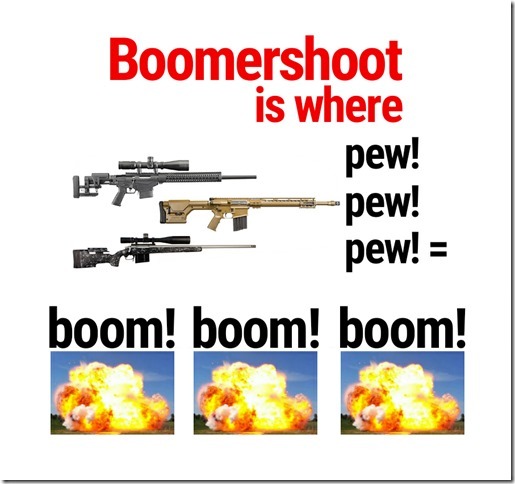 It’s not really all the ammo I would shoot in a year if it was free. It is a gift card for $1500 which might cover my .22 LR needs but wouldn’t come close to my total consumption. But, a $1500 gift card is nothing to be sneered at. To enter the raffle visit this blog post and give them your email address in the edit box at the top of the blog post. 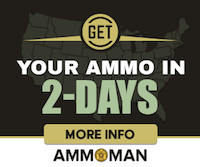 I’ve purchased stuff from them over the years (almost $2200 worth in the last 2.5 years) and I almost always check them for price and availability when I am purchasing reloading supplies. I sometimes find interesting things which I couldn’t find anywhere else. An example would be SS109 bullets for .223 in large quantities. Full disclosure: I was contacted via email by Widener’s about this “free ammo for a year” raffle. If I linked to their blog post about the free ammo they offered to give me a $25.00 gift card and entry in a different raffle with other bloggers who also posted about their raffle. The bullets, they do the killing, they kill. It’s up to us to figure out a way to wrap laws around the purchasing of ammunition. Just as “wrapping laws” around the purchase of alcohol and other recreational drugs didn’t improve society the restriction of a specific enumerated right not only won’t improve society it will be an infringement upon the natural right to defend ourselves. People can make ammunition from scrap metal a few relatively simple tools. Just as with recreational drugs, it won’t be of the highest quality but it will be good enough to get the job done. And it this case the job will be restoring our rights. At first thought you might agree. But it depends on how many rounds you reloaded before you lose a gun and the cost of replacement or repair of the gun. Assuming my gun is a total loss, I doubt this is true but lets go for worst case, I will have to have saved about $3200 to break even. Getting the cheapest brand I recognize from Midway USA in one case (1000 rounds) lots results in $0.329 per round after shipping. Hence by reloading I’m saving, at least, $0.089 per round. In order to pay for a new gun I would have to reload $3200/$0.089 rounds. 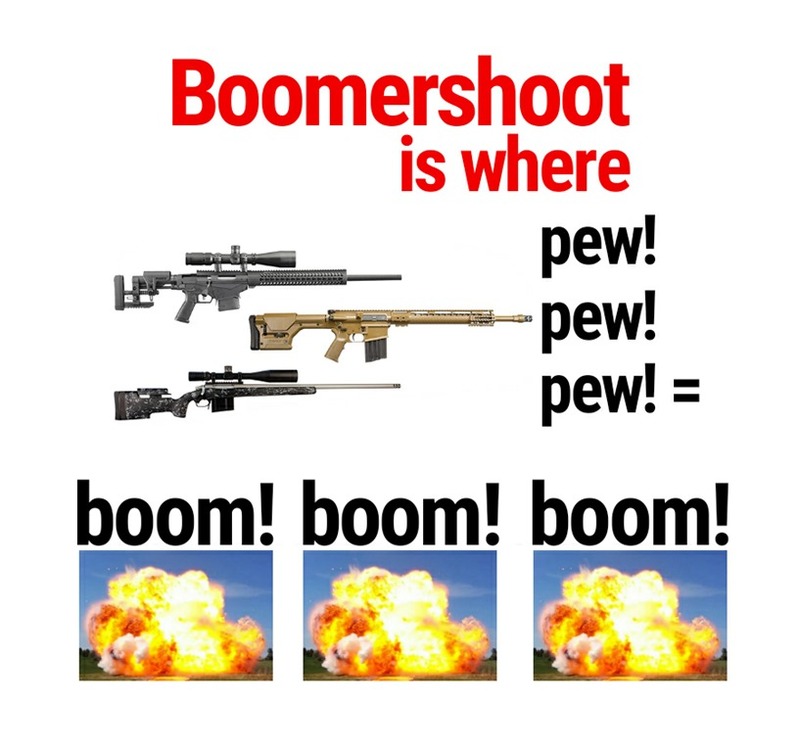 This works out to about 36,000 rounds. I have actually reloaded and fired about 84,000 rounds in .40 S&W. So by reloading, even if I have to buy a new gun, I still have saved nearly $4,500. Plus, having learned the lesson of how a can get a double charge with this load I can either change loads to completely avoid this or modify my quality control procedures to reduce the chances. This was using the worst case cost for reloaded ammo. It also doesn’t take into account that my reloads are lower recoil than factory loads and result in less wear on the gun. My actual savings is quite a bit greater than the calculations above indicate. Hence, in this case, the headline writer for The Gun Feed is wrong.